Nothing to do with music, except that I have to go to Leicester Square several times a week on my way to piano playing jobs, so when something changes about the station, I notice it. Recently though, I couldn’t quite put my finger on why I felt calmer on the way up the escalator from the Northern Line, until I realized it was because for the first time I can remember in all the years I’ve travelled on the tube, I could just stay with my own thoughts instead of being distracted by adverts every few centimetres, and I was reminded of the long rant I wrote about the “attentional commons” and New Street Station in Birmingham. It’s just a guess, but I think that you could probably reduce stress levels exponentially if you were to turn tube stations into places, rather than billboards. 12 of Europe’s most beautiful and impressive metro stations. This entry was posted in Personal and tagged Birmingham, Leicester Square, London, Matthew Crawford, Prague, attentional commons on April 13, 2019 7:41 am by Jonathan Still. 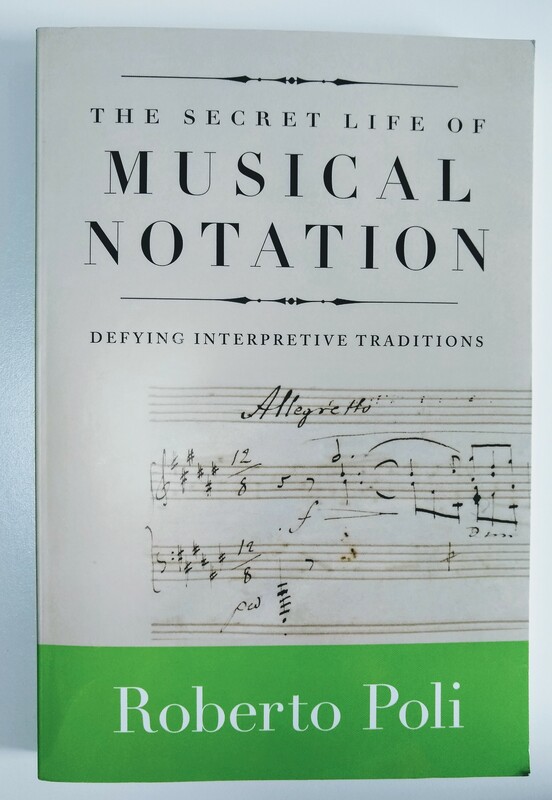 In The Secret Life of Musical Notation, Roberto Poli examines a number of notational conventions—hairpins, sforzandi, rinforzandi, pedals, stretti and rhythmic values—that have perplexed him as a performer, and led him to investigate the possibility that they don’t mean what we assume them to mean. I found the chapter on hairpins very interesting, and the evidence for there being a problem is persuasive: he shows a number of examples from Chopin’s work where the hairpins don’t make a lot of sense, either because they’re redundant (they show a hairpin as well as a diminuendo, for example) or because they contradict the musical sense: a “diminuendo” hairpin just at the point where you are getting to the high point of a phrase, and to taper off seems expressively illogical. When is a hairpin not a hairpin? His conclusion is that hairpins, among some composers and in a certain time period, denoted not [simply] increases or decreases in volume, but agogics, i.e. expressive timing. What we think of as a “crescendo” hairpin would mean pulling out (i.e. slowing down) towards the open end of the hairpin. A “diminuendo” hairpin would mean essentially a tenuto where the open end was, recovering normal tempo towards the end. Two hairpins together, with the open end in the middle, would mean treating the tempo of the bar with rubato. I’m reducing the arguments a little (the chapter is nearly 70 pages long), but that’s roughly it. Importantly, what appear to be accents might in fact be mini hairpins, and as such, are an alternative sign for what we would normally expect to be represented by a tenuto. As it happened, the day after I read the chapter on hairpins, I was down to play the Lilac Fairy Attendants from Sleeping Beauty on an Easter School, a piece that is really horrible to play on the piano, and doesn’t get any less horrible when you’ve done it at every summer school for the last 30 years. I was still in two minds about Poli’s thesis about hairpins, but I thought, let’s see how his theory fares on this piece. Whether or not Tchaikovsky fits in to the league of composers or periods when hairpins or “accents” could mean agogics or not, I am utterly convinced that this is a better way to read the score than any way I have done in the past. Using Poli’s analyses, one could interpret the “accents” over those notes as meaning tenuto marks, rather than accents. Do that once, and tell me you’re not convinced: what sense does it make to have accents on those notes when the marking is grazioso, and later pianissimo? For years, I’ve obeyed the music and put a little accent of sorts on that note, but when you get to the hairpin starting in bar six, why on earth would you get louder and accent those notes in music like this? But change those accents to tenuto marks, and pull out the music towards the F#, and give slightly more tenuto on the following B, and then on the bottom line, pull out towards the C#, and it all makes beautiful musical sense. You can play this music without any dynamic accents at all, only agogic ones, and it begins to sound like music again. Likewise, the accent on the D in voice 2 in the RH in the penultimate bar. A tenuto there makes perfect sense within the waltz, because there would be a slight hold there in the movement, but an accent is neither musical, nor does it give the right tempo feel to the bar that would be appropriate. As Poli points out, we are so conditioned by later performance practice not to conflate dynamics with agogics, that it’s difficult to imagine a time when it was considered perfectly normal and musical to do so. I compared the orchestral score to Siloti’s arrangement. Siloti has a narrowing hairpin in the last few bars, where the orchestra doesn’t, and it makes musical sense to pull out towards the end a bit. A conductor would do this without needing to be told in the score, but perhaps Siloti wrote his hairpin in the score to give an indication of what would be determined in orchestral practice. Another rather interesting thing is that the tendency towards metronomic tempi, and the going-out-of-fashion of this kind of agogics, has seeped into ballet as well. It’s a delightful rarity to work with a ballet teacher who lives and breathes expressive timing, but that may be a side-effect of performance practice in music rather than ballet. People my age will remember a time when to slow down at the end of a piece of early music was like wearing brown shoes in the city. We live in less dictatorial times I think, thanks to Taruskin’s diatribes against such things in Text and Act for example, but I hadn’t realised until this Sleeping Beauty experience how much my reading of notation followed such carefully self-policed rules. This entry was posted in Dance, Music, Personal and tagged Roberto Poli, Sleeping Beauty, Tchaikovsky, ballet music, hairpins, notation, performance practice on April 12, 2019 8:51 am by Jonathan Still. Kevin Richmond in Prague, 2008. Very sad to hear by chance (through this posting on Ballet.co forums) of the recent passing of the dancer Kevin Richmond, far too young. 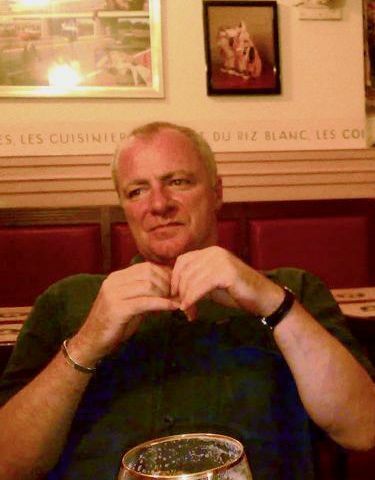 When I first started playing for ENB as a pianist in the late 1980s, and on tours with the company when I was full-time there in the early 1990s, Kev was one of those rare people who was able to make the ballet world comprehensible and interesting for me as a novice musician in that field. 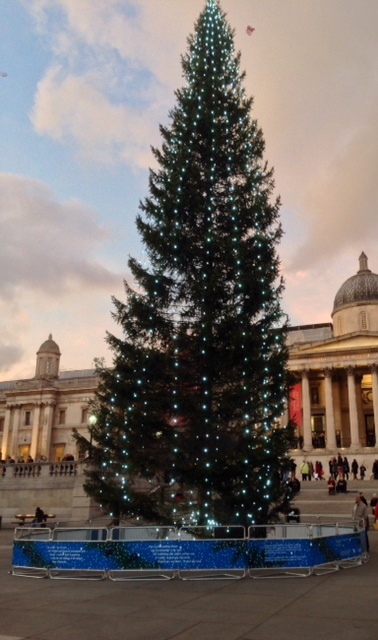 In 2008, I wrote a blog post about Kevin as part of my Advent Calendar that year, which was about favourite moments from conversations with dancers, dance teachers and choreographers. This entry was posted in Personal on March 20, 2019 11:52 am by Jonathan Still. Here’s a lovely idea for a Sunday in April—come to Charing in Kent for a day of learning to dance 19th century quadrilles with early dance expert Nicola Gaines. Nicola and I have done a few of these workshops before, and they are great fun, but also a wonderful challenge, as there are so many variants and possible embellishments of the basic idea. They’re also just very jolly and social. It’s a bargain at £35 for the day, £25 for concessions, £20 for observers. Readers of this site will know that I have a bit of a fascination for quadrilles. The interest began when I realised how much of the 19th century ballet repertoire owed to the rhythms and structures of quadrilles. Like other ballet pianists, I had searched the classical repertoire I knew for pieces that were suitable for battements glissés exercises and petit allegros in 2/4 or 6/8, and found very little. The day I discovered quadrilles, I realised I’d been looking in the wrong place all the time. (see earlier quadrille post). Quadrille music is kind of the Hooked On Classics of the 19th century. Composers threw together all the best tunes from opera, operettas, and ballets, making cuts and changes of tempo or time signature just so you could carry on dancing to it in the form of the dance that you were expecting. Sometimes, you have to listen twice to realise that some deadly serious tune has been turned into a 32-count galop, or conversely—as in the article on Rossini below—you are taken aback to realise that “serious music” in fact has all the hallmarks of a quadrille (Odette’s 6/8 coda in Act II of Swan Lake is a prime example—it’s prime jigging-about music). Any production of ROSSINI must bear his mark upon it, and must breathe his spirit: what that is may be best understood from the appearance of a set of “Stabat Mater Quadrilles.” This publication—a gross outrage upon decency, it must be confessed—shows the sort of ideas which ROSSINI’S music generates: and it shows also that those ideas are the very reverse of those which are conveyed in the words. Why is not PURCELL’S Burial-Service turned into a set of quadrille?—Not probably, from any regard to decorum if the speculation would be a profitable one, but simply because the thing is impossible. This entry was posted in Dance, Music, Personal and tagged 19th century dance, Charing, Music, Nicola Gaines, ballet music, classes, courses, early dance, historical dance, quadrilles, social dance on March 12, 2019 2:55 pm by Jonathan Still. Air de Ballet is a guide to 19th century piano repertoire for ballet class by Ethan Iverson, who used to be music director for Mark Morris’s dance company, among other things. The page is richly illustrated with scores, audio recordings and useful commentary. Although you can play all kinds of repertoire for class, the 19th century dance tradition (waltz, polka, mazurka) provides the workable rhythmic framework for exercises, even if your tunes come from Maroon 5 and Ariana Grande. My favourite creative tip from this page is the idea of improvising Czerny-esque etudes over the chord sequences of jazz standards (listen to his recording of Ain’t Misbehavin’ for an example). I’m also beginning to read some of the other articles on Iverson’s site, such as Mixed Meter Mysterium, a brilliant article on Stravinsky. Well worth stopping a while and browsing! I’ve added the Air de Ballet link to my Playing for ballet class: Links, books, suggestions page. If you have any more suggestions let me know, and I’ll add them. This entry was posted in Personal on March 10, 2019 9:32 am by Jonathan Still. Just a random observation this. There’s a little snippet of Les Patineurs (the red girls pas de deux, for which the music was taken from the Prelude to Act III of l‘Étoile du Nord) which is almost note-for-note the tune of “Dites-Moi pourquoi la vie et belle” from South Pacific. This entry was posted in Personal on December 18, 2018 10:02 am by Jonathan Still. Christmas carols for ballet class: get ready for advent! Five years ago, as an “advent calendar” I uploaded a free ballet-class version of a Christmas carol every day for advent. As it’s getting to the time when teachers start putting their festive classes together, if you haven’t had enough of these already, or haven’t tried them yet, here’s the link to all of them as a list. The last one in the list is a link to download all the tracks at once. This entry was posted in Personal on November 17, 2018 8:03 pm by Jonathan Still. A book review (of Tia DeNora’s Music Asylums: Wellbeing Through Music in Everyday Life) I did ages ago has now been published online in Current Musicology. It might not look like much, but it was one of the hardest things I’ve ever had to write, but it was worth it. The book itself seemed such an easy read first time through, but when I came to try and condense the main points for a review, it was a lot tougher. I was going through some kind of romantic phase at the time when I thought there must be something organic and better about making notes in longhand. I thoroughly enjoyed the feeling of using a fountain pen again, but in truth, it turned out to be the biggest waste of time and effort: I’m now re-typing those handwritten pages into MaxQDA so I can make some use of them in my other work. DeNora uses a wonderful metaphor to describe the complex temporality of music therapy, whose effect might not be immediate or direct: the good that music does in a person’s life might come later—perhaps much later—than the intervention itself. To capture this, she describes it as being like the future perfect tense (e.g. “I will have done”). That idea has dropped into my head at least once a week in connection with some experience of my own. Whenever people ask me if I enjoyed the three years I spent in Berlin, for example, I have to try and explain that when I was actually there, I was often miserable—but it was one of the most enriching and wonderful periods of my life, from which I continue to draw so much in different ways even today, It’s not retrospect or nostalgia, and it’s not the same as saying “it was awful, but it was good for me.” It’s a feeling that something is by nature good (not awful) in some kind of eternal time zone where when you are ready for it, you can draw on its goodness. This entry was posted in Personal on October 23, 2018 9:17 pm by Jonathan Still. My recent discovery that one of the interpolations in Coppélia for Franz’s variation is from a “Scottish” ballet (Gretna Green, by Guiraud) encouraged me to re-watch Philip Tagg’s wonderful hour-and-a-quarter long documentary on the so-called Scotch snap. I say “so-called” because that’s the chief take-home point of the documentary: it’s called the Scotch snap, but it was once as characteristic of English music as Scottish, and the speech rhythm from which it derives is still prevalent in English today. If there’s a reason why we think of it as Scottish, or “Celtic” it’s because the English musical tradition where it was once common has been wiped clean, “upgraded” as Tagg puts it, of such elements, precisely because they became associated with lower class, country people. I suppose you could compare it to the way that people with regional accents or sociolects are taught RP in elocution lessons. English music from roughly Handel onwards became the Elisa Doolittle or Lina Lamont (see below—and for more on all this, watch Tagg’s video). As Tagg argues in his video, what this is about, surely, is not so much race, nation or ethnicity. but class. The same seems to be true of Coppélia: it doesn’t really matter (at least to modern audiences, I suspect it did matter to Delibes) where Franz comes from, what matters is that he’s a rustic local, not a prince, or an urban(e) shopkeeper or toymaker. In theory, Franz could be dancing to Chopin, since Chopin was Polish. But how wrong would that have looked? Chopin is the wrong class of Pole, the concert-giving, salon-performer in Paris, the poet with a floppy cravate in Les Sylphides. Franz is a rustic, like those villagers in Giselle whose waltz is all Bohemian snaps. But I’m leaving out an important detail here. The music that Delibes *cough* “borrowed” the “Friends” tune from, is an art song by Moniuszko (see earlier post for all the details), and the “snap” doesn’t exist in the original: it’s something Delibes added. 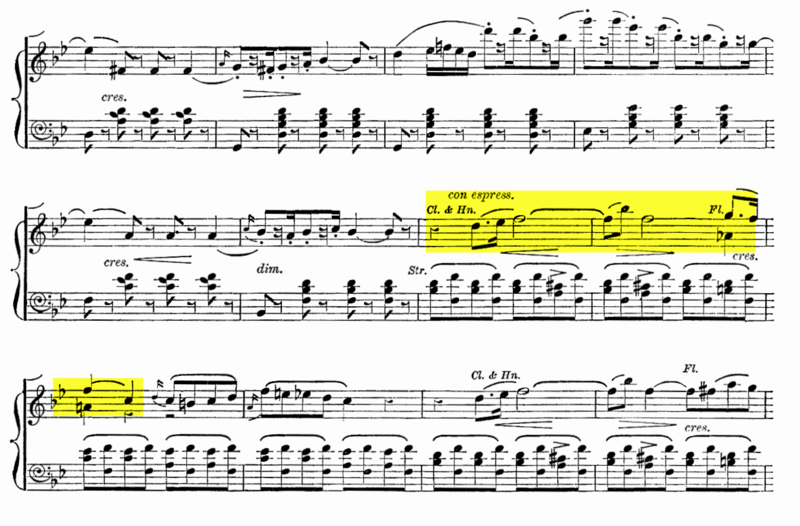 The notes at the same position in Moniuszko’s song are semiquavers, and they are for a single syllable. Fair enough, there’s an acciaccatura in the piano accompaniment but does that amount to a Scotch snap? Not really, I think. I can guess how that Gretna Green solo ended up in Coppélia. It sounds kind of foreign, kind of rustic. That’s usually enough geographical detail and social context for the average ballet scenario. I once heard a student ballet teacher tell a class of children, “Your hands are like this in this dance, because they would have…” That phrase, they would have has stuck with me ever since: she was talking about character/national dance, referring to people from another country as if they were not only remote geographically, but also historically. There was no detail about who “they” were, or where they were from, they were just “they.” The construction would have seemed to imply that what these people did (whoever, or wherever they were) could not be documented in terms of real people or events, but just as a list of possibilities, of permanent characteristics. That sums up the strange universe of ballet pretty well. We do this, they would have done that. I’m not sure what it was that the hands were supposed to be doing. Digging potatoes? Showing off handkerchiefs that they had embroidered? It’s not the students’ fault: this is the casual, institutional racism, snobbery and ethnic nationalism of ballet that seeps from the walls of the art form. Before continuing, let’s take a moment to remember that “Friends” is not by Delibes, and nor is the Csárdás, and nor is this variation for Franz. I’m not sure what a “rich nationalistic melody” sounds like, or that Delibes “folk dances” are really that complex, but never mind. The main point is that ballet seems to need those Scotch snaps (or Celtic, Hungarian, Polish, Galician, Bohemian or whatever kind of snaps they are) to prevent the music from being a wall of ballet gammon, or perhaps ballet mayonnaise. It’s a perverse form of “poverty tourism” where you can admire the rustics from the comfort of your box in the theatre, but at the same time shine a light on your own dullness, your lack of the rhythmic vitality demonstrated by the people on stage. No-one, particularly not your average ballet audience, would actually want to go to those places of course. One of the punishment for academic misdemeanours at Durham University was (and still is) “rustication,” i.e. being sent back to the sticks. According to a lecture by Dr Martin Pollack, this is apparently how Austrians (who annexed it in the 18th century) once viewed Galicia, a place you didn’t want to get sent (one writer referred to it as “Halbasien,” “half-Asia”), at least, until the job of Germanification had been completed, and the locals had been tamed. Of course, there is poverty, and there is staged poverty. Pollack mentions that his stepfather had been stationed in Galicia in the first world war (so less than 50 years after the premiere of Coppélia). His memory of those experiences included “wide wooded uplands, and impoverished hamlets where everything was built from wood, even the churches.” The wooden churches were what surprised his stepfather most, since in his native Austria, he had never seen such a thing. One thing is for sure: it didn’t look like the set of Coppélia. Next on my list is La Truandaise from Esmeralda, another example of the “Scotch” snap being used to denote otherness that is geographically vague (Bohemian? Gypsy?) but definitely poor. In the video below (assuming YouTube don’t block it) of Osipova dancing the “Truandaise,” the flexed foot is perhaps the movement equivalent of the Scotch snap. She does it, because (as a ballet teacher might say) they would have flexed their feet (because they couldn’t afford to go to ballet classes, and find out about good toes and naughty toes). So how could she afford pointe shoes then? Best not to ask too many questions. Tagg demonstrates through many examples that the Scotch snap rhythm is common enough in English speech that it is bizarre that it should have come to denote anyone from the British Isles except the English (as “Celtic” has come to mean). Playing for class today, I discovered another example: “Feed the Birds” from Mary Poppins. Tup-pence, Tup-pence. I “discovered it” because as I was playing it, I thought first of all, “here’s a rather odd example of a “Bohemian” snap in a musical, until I realised that is not Bohemian at all, but English—and, fitting Tagg’s hypothesis, it’s a certain kind of Englishness—an old beggarwoman selling breadcrumbs for tuppence a bag. If you’d never seen Mary Poppins, and just heard the tune of Feed the birds, you might well think that it’s a tragic song from old Bohemia. Feed the birds is an interesting case. According to the Wikipedia page on the song, the author of Mary Poppins, Pamela Travers, only wanted period Edwardian songs in the film, and had to be coaxed round to Americans writing the soundtrack. Oddly, it turned out to be an excellent choice, because the Sherman brothers portrayed Englishness in music particularly well with those “Scotch” snaps (there’s another one in A spoonful of sugar. The class issue is less clear there, though Mary is still only the nanny, however posh she might be). Listening back to “Feed the birds” with Tagg’s documentary in mind, I wonder what it is that I think I can hear—and it’s the very ordinary speech of my childhood. My dad, and the local shopkeepers saying “tuppence” or “tuppence ha’penny,” or “throppence.” The (musical) idea that the Scotch snap is Bohemian, gallic, celtic, Hungarian, or whatever, has blinded me to the rhythms of my own speech. Extraordinary. What a difference a demisemiquaver makes. And how much history you can write, just by focusing, as Tagg does, on detail like this. And as one final aside, writing this post I came to hear of a novel I should have known about years ago, Joseph Roth’s, Radetzky March (Dr Pollack mentions it in his lecture), and am thoroughly enjoying reading it. I wish I had read it before any of my travels in what was once the Austro-Hungary, and I suspect it will make great background reading for Coppélia. This entry was posted in Personal and tagged Coppélia, Delibes, Giselle, Guiraud, Moniuszko, Philip Tagg, ballet music, musicology, nationalism, scotch snap on August 17, 2018 11:34 am by Jonathan Still. I said it had been a week for finding things: well, it’s not over yet., apparently. As this will be a longish ramble about finding music, I’ll cut to the chase. 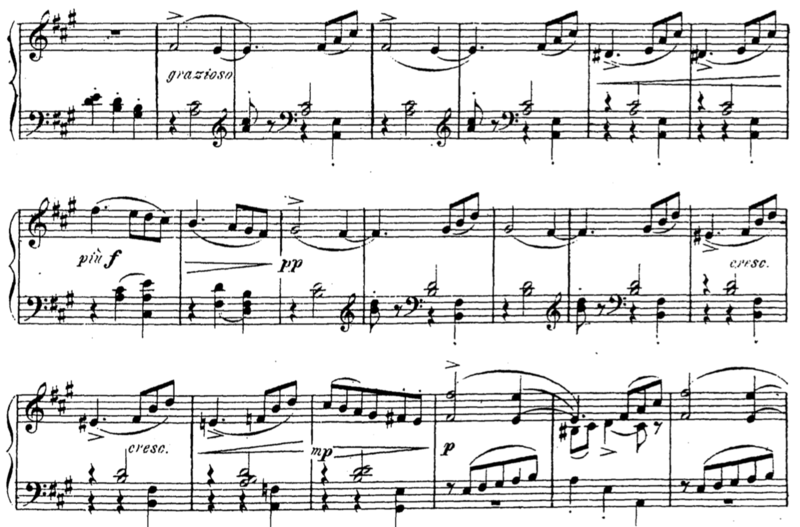 The Bugatti Step by Jaroslav Ježek is a fantastic piece of piano music that you could use for class, and the sheet music is available online. I’m not usually guarded about sharing ideas for class music, but in this case I have to confess it’s taken me weeks to do so, because I love it so much, I don’t actually want my colleagues to have it in their repertoire as well. But I can’t help it. It’s too good not to share. What prompted me to finally share the score was that the route to finding it (and other music by Ježek) has been so delightful and interesting. Not long after I vacated Facebook and Twitter a few weeks ago, I was listening to the radio in the car, and heard Barry Humphries talking about his forthcoming show at the Barbican, a presentation of music from the Weimar period, including some of my favourite cabaret songs and composers. As I love the music of this period, I thought I can’t possibly miss it. I checked the dates. Then, because I wasn’t on Facebook anymore, I wrote an old-fashioned email to someone who I thought would appreciate this as much as me, but who is probably the busiest person I know, and lives hundreds of miles away. I don’t suppose by any chance you’re in London when this is on, and free? As it turned out, he was, and so we went, and it was wonderful. Barry Humphries presents this collection of music as if you’re having a pleasant after dinner chat in his sitting room (or, if you’ve ever been there, the Kleine Philharmonie bar in Berlin, which in turn looks like the set of Cabaret). The story he tells is wonderful: as a young man, he discovered this music in second-hand shops in Melbourne, remnants of the possessions of Jewish refugees from Nazi Germany, who had clearly loved the music enough to bring it with them. He fell in love with it, and has ever since nurtured a fascination with it, leading eventually to this show. One of the first pieces in the programme was Bugatti Step, played as a piano solo. I couldn’t help thinking, this is wonderful music in itself, but it would also be great for class, so I made a mental note to check it out afterwards. The composer, Jaroslav Ježek, (known as “the Czech Gershwin”) as so many others, was forced in the late 1930s to flee the Nazi occupation of Czechoslavakia and go to New York, having until then been a huge contributor to the Czech music and theatre scene. What comes across as Humphries introduces the music, is a sense of loving and cherishing these pieces, of giving them the value and the hearing they deserve; a will for them and their composers not to be forgotten. It’s infectious, but It’s something more than enthusiasm; there’s a warmth and intelligent sensitivity about Humphries’ advocacy of this music that sometimes helps you hear it almost too closely for comfort; you hear with the ears of those who wrote it and heard it at the time. It’s hard not to draw parallels between the politics of then and now. So now fast-forward a little (I went to the concert on 23rd July, and it’s now 10th August), and I see an former Czech colleague of mine at the studios in Prague—she used to play for class when the ballet masterclasses in Prague that I’m at now first began. Years ago, she had told me where I could find a second-hand music shop in the city. I asked her it was still there. She checked on her computer; she wasn’t sure, but there’s this bookshop in Wenceslas Square No. 42 that has a new and second-hand music department. By chance, I was walking there in the afternoon, so popped in. And blow me down, one of first things I see on the shelves is a book of 81 songs and dances by Ježek, arranged for piano byu Sidonius Karez. 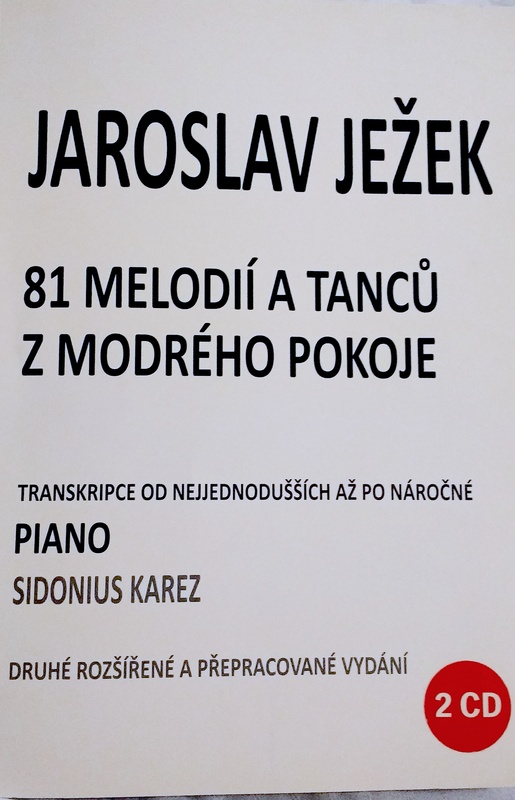 (81 melodií a tanců z modrého pokoje). I had to buy it, even if I wasn’t sure what I was going to do with it. I’m glad I did. It’s a wonderful book, lovingly and carefully put together, with interesting panels of information about Ježek and photographs of him and fellow musicians and performers from the Liberated Theatre in Prague. I can just about work out what it all means, with a bit of help from Google Translate, and my background as a Slavic languages graduate. I start to search for the original 78rpm recordings on YouTube. The music is just wonderful. I’m telling the story because it’s not the first time that my route to finding music has been face to face, material, hand to hand. Meeting people, going to bookshops, being present somewhere. If I hadn’t been to that concert at the Barbican, I might never have heard of Ježek, or had the chance to be thrilled by his music. Barry Humphries found the music in a second-hand shop where it had come from Europe in the 1930s. And now, I’m finding more of it, actually in Prague, in a bookshop, because I bumped into my colleague and she recommended that bookshop. I would not have known what I was looking at, had it not been for someone bringing that music to Melbourne in a suitcase, and Barry Humphries looking after it, and years later, presenting it at the Barbican. If I hadn’t got off Facebook and made the effort to make arrangements to see a friend in real life, I wouldn’t be writing this now. There are other ways to find music, of course, and YouTube is great for researching what has already triggered your interest. But for me, at least, the music you discover like this, passed from hand to hand, music that you can touch, or music that you hear in the physical presence of others, is somehow always more precious. Barry Humphries tells a story in the show about how his mother didn’t like library books “because you didn’t know where they had been.” For him, that was precisely what he liked about them, and that was the appeal of the music he had found in the second-hand shops that led eventually to this concert. This entry was posted in Free sheet music for ballet class, Music, Personal on August 10, 2018 9:11 pm by Jonathan Still.